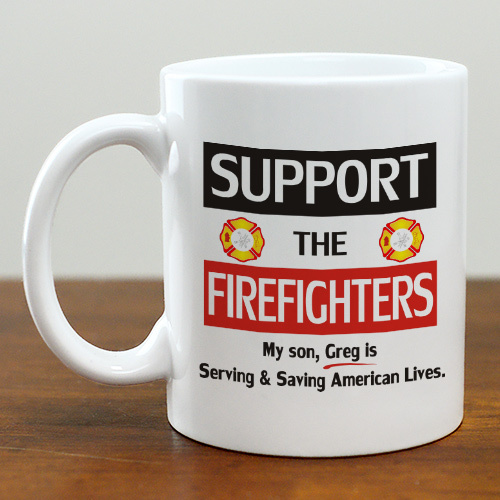 Show your support for your favorite Firefighter with your own Personalized Support the Firefighters Coffee Mug. A unique Firefighter Gift the entire family can enjoy while displaying their love and support for a member of the local fire department. Outfit your favorite Firefighter in Custom Firefighter Apparel. We have great personalized firemen gifts that never go out of style. A Personalized Firefighter Gift is perfect for Dad, Uncle or Grandpa on Father's Day, his birthday or Christmas. GiftsForYouNow.com has many additional Personalized Gifts for your many special gift giving needs.